Takeo Watanabe (渡辺岳夫) was born on April 16th 1933 in Japan. 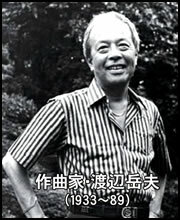 He was the son of Urato Watanabe, a professionnal musician and composer. Takeo Watanabe mainly composed for japanese TV drama (e.g. The white tower) but it’s the music he wrote for japanese anime that made him famous (e.g. Candy, Georgie, Sandybelle…). The force of his melodies was to instantly evoke profound feelings. The sadness was a feeling often depicted in his compositions, in order to fit to sad stories contained in these anime’s scenarios. That melodies are memorable and stay with you long after you turn off the music. That melodies are always carried by beautiful arrangements. Each instrument, each note, each breath, beautifully fits in its place. The variety of instruments used by the musician is impressive : piano, harpsichord, organ, acoustic and electric guitar, flute, accordion, drums… When Takeo Watanabe had to compose a musical theme, he read the scenario and attempted to translate the feelings of the characters into the melody he wrote. His force was to relay these same emotions successfully to the listener.